This is going to be another post about your grandma being wrong. This time my beef is about Brussel sprouts. The little guys have gotten such a bad reputation and it’s really not their fault. Sorry Grams, but throwing a veggie in a pot of boiling water until it’s soft and mushy is never the answer. Never. I know it’s probably handy to cook things this way because it can suffice for little Jimmy as his baby food and Grandpa can eat it with his dentures, but it just isn’t fair to the vegetable. Anyways the point is that I love Brussel sprouts and I bet everyone would if you treat ’em right. As in, roast them or grill them. They crisp up and have a really nice texture. This bruschetta is really quick and easy and great for lunch or as an appetizer. Use good bread to make this extra yummy! 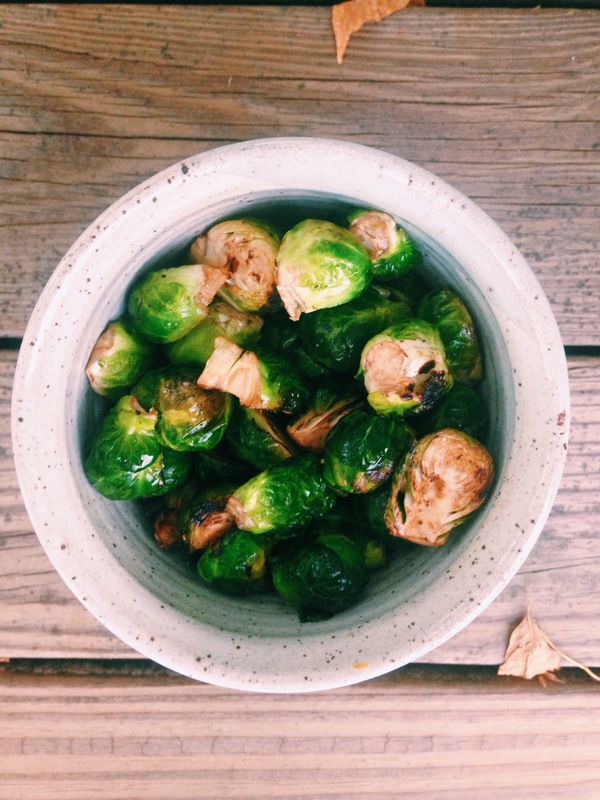 Give brussel sprouts a chance! Half the brussel sprouts and place in a medium sized mixing bowl. Drizzle over some olive oil and balsamic vinegar – about a tablespoon or so of each – and toss them around. Grab some tin foil and head out to the grill. (No need for foil if you’re using a grill pan inside). Fire up the grill. Place the halved brussel sprouts onto the foil and put in the grill. Arrange them in a single layer, cut sides down. Cook until they have grill marks and are crispy on the cut side, moving around and removing them as necessary (some will be done before others depending in their position on the grill). This should take 10-15 minutes. When the brussel sprouts have cooked, go back inside. Pop the bread in the toaster or in the oven to crisp up.Half the halves again (so they are quartered) and put back into the mixing bowl. It will still have some olive oil and balsamic in there from earlier, and there’s no point in wasting it. Quarter the cherry tomatoes, and then finely chop the garlic and the basil. Add those to the bowl as well. Add a smidgen more oil if needed and toss that all around. Put the bread pieces onto a plate and spoon the bruschetta mixture onto them. Drizzle balsamic vinegar over the top and grind over some black pepper (and salt if you want- I didn’t put any). 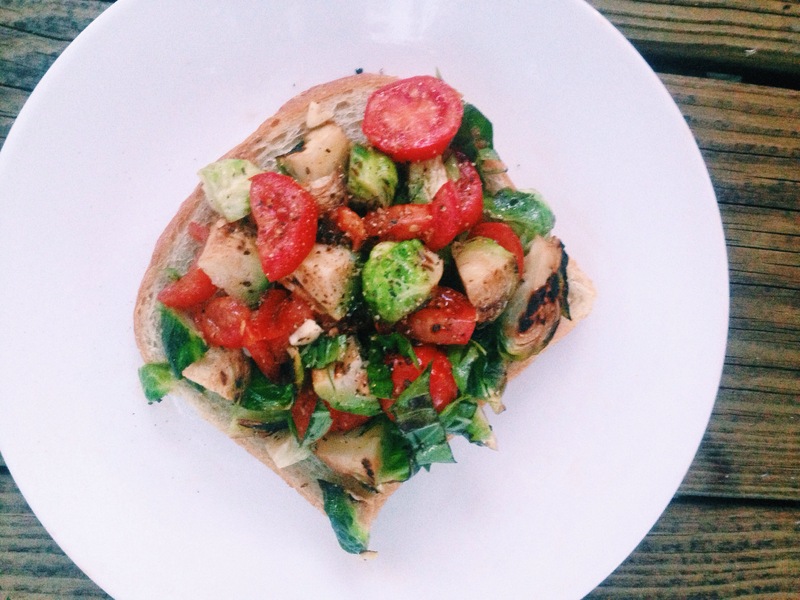 You could also do this with roasted brussel sprouts! Prepare the same way with olive oil and balsamic, then roast at 400 degrees until crispy, about 20 minutes. If you want to sub another veggie, try grilled eggplant. Next Post Quick Note on Preserving Herbs! WOW this looks so good! 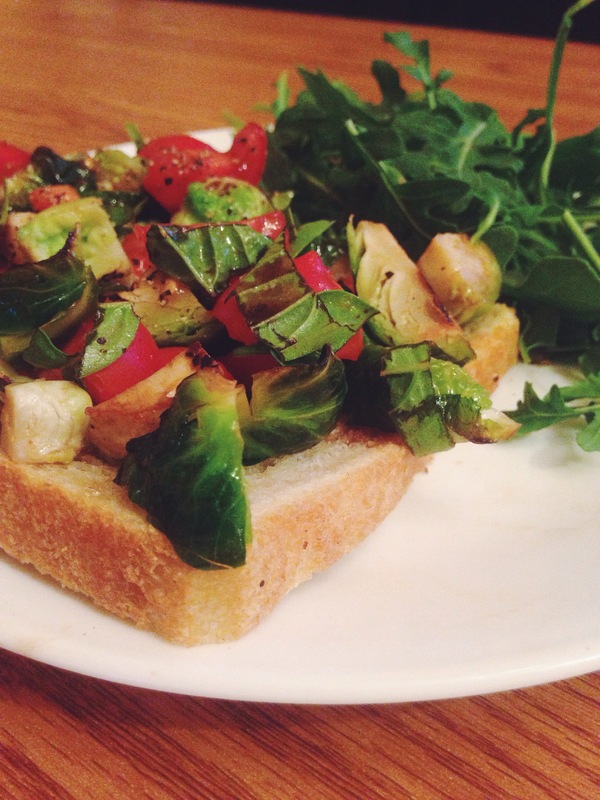 I’ve never seen brussel sprouts on a bruschetta before, looks tasty! 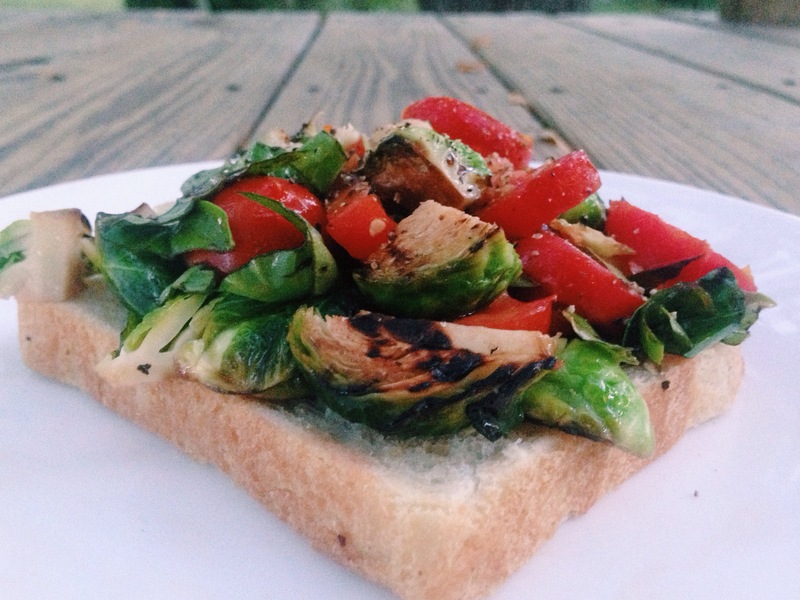 This looks good I would never have thought about putting Brussels on bruschetta. Thanks for sharing.